Since I won’t be travelling for a few months (4 months, 10 day & not sure how many hours yet) the next best thing is to do it vicariously by reading about other folks’ adventures. 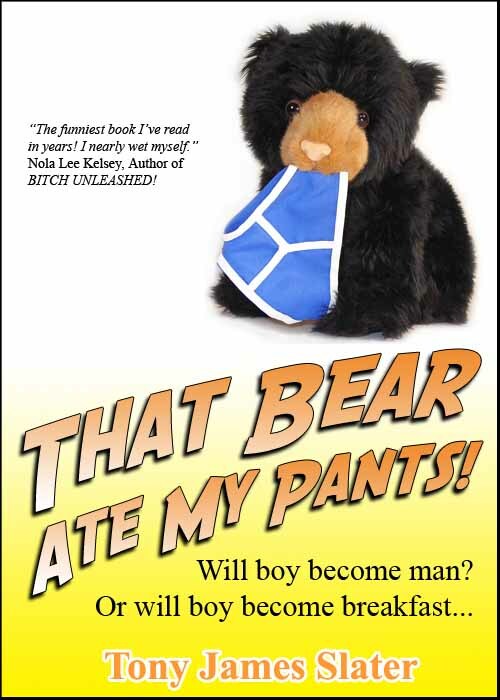 Some how during a click-a-thon I came across “That Bear Ate My Pants! Adventures of a real Idiot Abroad” by Tony James Slater. Couldn’t help myself – I bought it on the spot just for the title. It is truly the most hilarious book I have ever read, and I’ve read some good ones. It was a “In-Starbucks-laughing-so-hard-the-tears-came-and-I was concerned I was going to pee myself” kind of reading experience. This is about Tony’s experiences volunteering at an animal sanctuary (sadly now shut down) in Equador way way way up in the Andes mountains. Having no experience with animals, except for a brief relationship with a rabbit when nine, this was a whole new world of pain that opened up for him. His style of writing is so guiless and honest, never for a minute trying to gloss over his bumbling and immoral adventures in an effort to make himself look good. Oh no, our boy Tony is out there, willing to spare no expense to make us laugh. 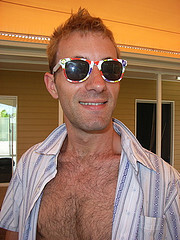 For some time I have believed that the Y chromosome in men stood for “Y the Freak NOT?”. Well Tony has an extra one. So from a rabbit to a Giant Galapagos Tortoise ( you will have to read the book to get the story on that one), bears, Coatamundis, a chubby Puma, Ocelots, Buzzard Eagles and so many more. And Jimmy, likely the most dangerous of the lot. The personification of the macho Ecuadorian male, Jimmy found great pleasure in questioning our hero’s masculinity. Stirred well, this soup will make you laugh your face off. Tony… just look at this guy! He was born to make folks laugh! Just writing about it makes me want to go back to it again. Hope you give it a read. For $2.99 it will be the best deal you’ve ever had. NOTE: This is only available on Kindle but you can download the app (of course you can) and read it on any of your toys. Another note: Please don’t think for a minute that this is indicative of all volunteering experiences, cause it is not. The good organizations work hard to make sure that their volunteers have a positive and safe experience since their very existence depends on it. The bad ones, well not so much, which is why you should do your research. The internet makes this kind of travel possible for so many more people. Google, of course but also make use of facebook, which is a veritable mine of information and feedback on these organizations. If you have any amusing tales of chasing tails, I’d love to read about it – just put it in the little box below, called “comments”. Cheers. Thanks so much for this awesome review of my book! I had an amazing experience volunteering, though of course in the process of writing about it, it might have come across as being rather difficult! In fact that was mostly my fault, as I have a bad habit of ending up wherever anything is going wrong… plenty of my fellow volunteers sailed through their experience without a scratch! Santa Martha did close eventually, I think there were some dodgy dealings going on there in later years – but there are, as you say, countless fantastic volunteer organisations all over the world that make this sort of adventure a real option. A good one not far from where my book is based is Toby’s refuge in the jungle – it’s called ‘Merazonia’ and it had a great reputation! Well, thanks again for the amazing review! I’m working hard on my second book now, featuring what happened after I got home from Ecuador – when I tried (and failed) to become a tv celebrity (!) – and then decided to sod it all and buggered off to Thailand for a year, to do some more volunteering! Tony thank you for the book and I look forward to the next one… in what 5 years. :}. Thanks for dropping by, I’m on my way to Thailand in Jan. so let me know of any place I should not miss.